Wearing her signature pink cape, the Flopsy Bunny Money Bank is an adorable addition to your child's bedroom shelf. 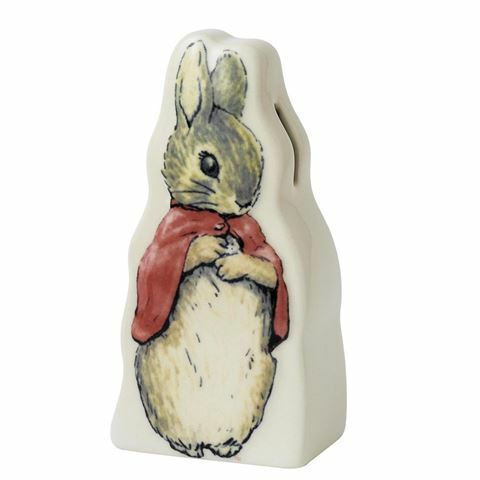 This delightful money bank is crafted in ceramic and is gorgeously painted, and features tiled blackberry illustrations on the back, so it will surely become a keepsake that will see your little one through to adulthood. Meanwhile, the convenient rubber plug on the base of the money bank allows your little one easy access to their savings. Convenient coin slot on the right side of the money bank. Stopper in base for retrieving money. Dimensions: 17cm (l) x 8.5cm (h) x 5.5cm (d).